From Goodreads: Hadley St. Clair's life changed the day she came home to a front door covered in slips of paper, each of them revealing the ugly truth about her father. Now as her family falls apart in the wake of his year-long affair, Hadley wants everyone-her dad most of all-to leave her alone. Then she meets Sam Bennett, a cute new boy who inexplicably "feels like home" to Hadley. Hadley and Sam's connection is undeniable, but Sam has a secret about his family that could ruin everything. Thoughts on the Novel: Going in, I knew that romance would be a prominent feature in Ashley Herring Blake’s Suffer Love due to the cover. What I wasn’t expecting from it was to explore how an extramarital affair can affect not just a spouse, but the children as well. Early on in Suffer Love, it’s revealed that Sam’s mother and Hadley’s father had a year-long affair with each other. Months later, both families are still reeling from the news. Feeling betrayed by her father, Hadley no longer believes in love, and seeks meaningless comfort from guys. Meanwhile, Sam’s father has moved away, and his mother spends little time with him. Both Hadley and Sam’s emotions felt realistic, as did the connection between them. Though it's obvious that Sam and Hadley will eventually fall for each other, I wanted to know whether their relationship would survive, given the awkward circumstances. Unfortunately, I wasn’t entirely satisfied with the answer since it acknowledged, but didn't really address the problem. 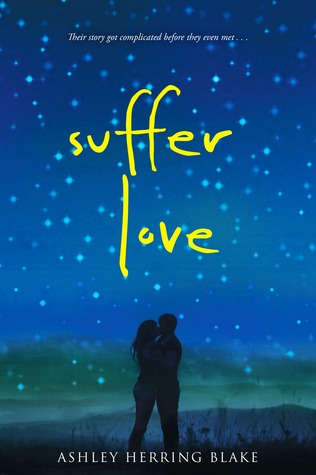 Suffer Love will be released on May 3, 2016 by HMH Books for Young Readers. In exchange for an honest review, this book was received from the publisher for free via The Fantastic Flying Book Club. You can follow the rest of the tour by clicking on this link. Also, visit Ashley Herring Blake's website to find out more about her and follow her on Twitter at @ashleyhblake. Hm. I think I would enjoy this one overall since I'm a romance lover, and I haven't read anything where the parents have cheated and the kids have to deal with the aftermath. Adding it to the list! Bummer, I was hoping that they would address the awkward situation. Cheating is a hot button issue for me so I think I may have to skip this one. Heh, I would be embarrassed to have a cover like that on the bus too :) Sorry this one was a bit unsatisfying for you - it's not the kind of story I'm into so I'll skip it. Lol. I would be a little embarrassed about the title, too. Anyway, I'm a curious about this one even though you struggled with the relationship between Hadley and Sam. I do have a feeling that I will be mad about the adults though. Eeehhhh I'm not sure how I feel about this premise. Their situation sounds so awkward I don't know if I could get behind the romance. Especially since it doesn't really address it properly.